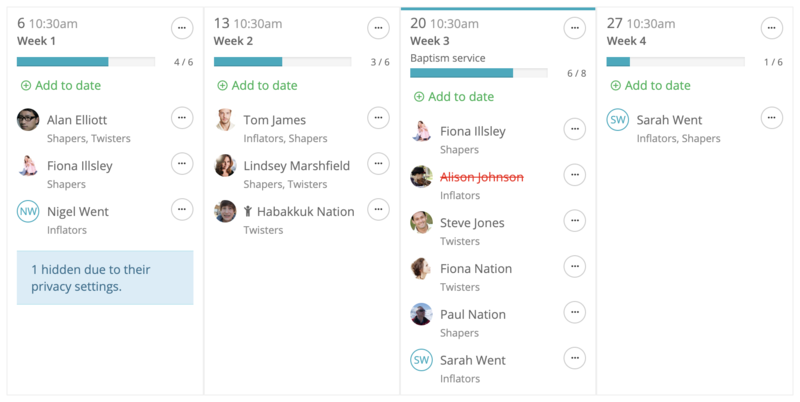 While rota members can manage their own rota serving commitments, organise swaps (if option enabled) and add their unavailability in My ChurchSuite, Ministry Overseers have the full functionality of rota management in My ChurchSuite too; meaning that they don't need to be given user access to the Rotas module in ChurchSuite if you wish. Here's a helpful feature overview video to get you started. Before Ministry Overseers can use My Rotas to create and manage rotas, there are some Rotas module options and Ministry settings that first need to be set. Head to the Rotas module options, accessed via the cogwheels icon in the top-right corner of the module (you'll need Administrator or Manage module permission to be able to access this). Select the My ChurchSuite Options. Begin selecting to Enable My ChurchSuite access - this setting enables (or disables) the My Rotas section within My ChurchSuite. Once enabled, Ministry Overseers and rota members on an active or future rota will be able to access the My Rotas menu within My ChurchSuite. Optionally Enable All Rotas access if you would like those with My Rotas access to also be able to access the All Rotas report, which is essentially a rotas overview page showing all rota for a selected date. Next, if you wish to disable rota swap functionality, tick to Disable Swaps. Doing so prevents rota members from processing swaps in My ChurchSuite, although overseers can of course still make swap changes on the rotas they oversee. Note that this is an account-wide setting across all ministries and sites, meaning that rota members will need to contact the ministry overseer for swaps to be processed if swaps are disabled in the Rotas module's options. The Navigation option allows churches to rename the "My Rotas" section, perhaps to suit different terminology used in your church context e.g. "My Teams". Finally, each rota has its own unique Group Email address which rota members can use to communicate with one another, perhaps to organise swaps, circulate prayer requests and other important information. While the rota group email cannot be disabled, you can select 'who' group emails are distributed to - either Ministry members or Rota members (recommended). The latter includes people who have been added ad hoc to a rota who are not part of the linked ministry. Having reviewed your Rotas module options, click Save Changes before navigating away from the page. 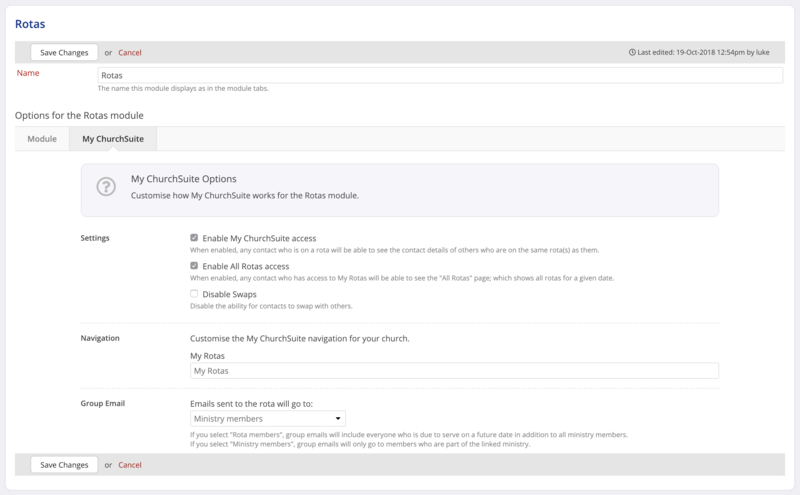 Module options are only accessible by ChurchSuite users with appropriate permissions - overseers cannot make module option changes from within My ChurchSuite. In this article we assume that you have already setup your Ministry - including configuring any rota reminders (Email and/or SMS). For further information on how to create a new Ministry, see the related article How to create a rota. Overseers can only create and manage rotas in My ChurchSuite if the underlying ministry has first been added in ChurchSuite - it's not possible or intended that overseers create ministries from within My ChurchSuite. To assign an overseer, head in to the ministry in the Ministries section of ChurchSuite and select Edit [ministry]. In the Overseer(s) section, use the Search for contact to add each overseer for that ministry. Overseers will receive email notifications of swaps; they will also have Manage Rota permission in the My Rotas section of My ChurchSuite. Click Save Changes before closing the page. To manage rota in My ChurchSuite, remember that overseers will need to have Allow My ChurchSuite login enabled in their Address Book profile and have been sent an Invite to access My ChurchSuite. Having assigned overseers to your ministries, the remainder of this article explores the features and functionality available to overseers in the My Rotas section of My ChurchSuite. Overseers can add easily add a new rota. Rotas are added with a Draft status, perhaps while they are still being set up; after which they can be Published and distributed to the rota members. Draft rotas can only be accessed by overseers; published rotas can be access by all the rota's members. To add a new rota, click the + Rota button located on the right-hand side at the top of the Rotas section. On the Add Rota page select the Ministry - only ministries that you oversee are available in the drop-down list. Work through each of the remaining rota settings, selecting the Service to which the new rota is to be assigned, and the Date range that the rota will run from and to. Rotas run for a set range or dates. While it is possible to extend an existing rota by adding dates individually, it's intended that new rotas are published as the old rota is expiring. In this way you can be working on a draft rota for the next season while the existing published rota is running. Next, set the Days that rota members serve - the rota will be created with dates for each of the days within the rota's range of dates. Set the serving Time range that rota members will typically be expected to serve on each rota date. You can minimise false 'clash' occurrences by setting accurate times that reflect when your rota members are actually serving - remember, it's entirely possible for people to serve in more than ministry in a Sunday service if the times don't clash, as long as the rota serving times are set accordingly. There is also the option to disable Clashes entirely for a rota - see the related support article for further information. Now set the Team Rotation - either Ad Hoc, Simple Rotation or Serve 13. The team rotation set for the Ministry is suggested by default, but this default can be overridden. Depending on the team rotation you select, further rotation options become available. For Serve 13, which requires at least 4 teams, you'll have the option to select the Teams to Rotate. For Simple Rotation you'll have the option to select the Repeat Rota, Teams to Rotate, the Start Team and the Serving Pattern. For Ad Hoc there are obviously no team rotation options, but you can set the Repeat Rota. Finally, tick to Allow members to sign up to future dates on the a rota - see later in this article for further information about Rota sign-up - sign-up can be enabled later if you wish. Ad Hoc. If the ministry doesn't follow any serving pattern, e.g. once per month on the first Sunday, select AdHoc. 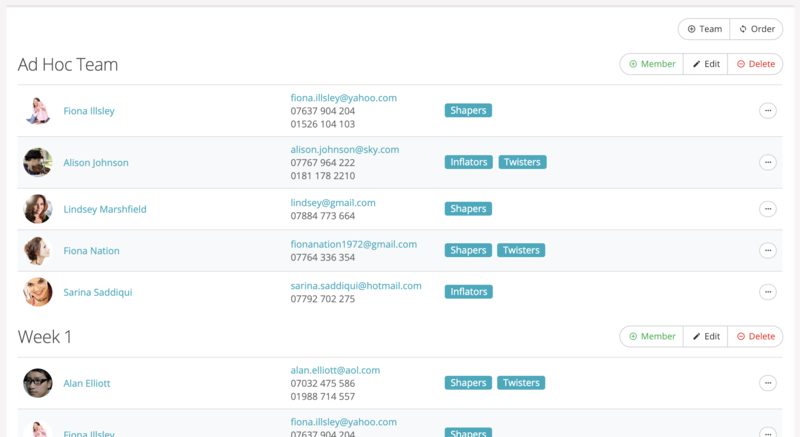 When you add a new rota you'll be able to manually assign individuals or teams to each date on an ad hoc basis. Simple Rotation. Create any number of teams (a team can have any number of members) and have them follow a simple rotation pattern. For example, if a team serves every 3 weeks, create three teams; if a team serves every 6 weeks, create six teams. With 'Simple Rotation', specify which 'Teams to Rotate', the 'Start Team' for the rotation, and the 'Serving Pattern' for each team. It's possible to exclude team from rotation e.g. a Reserves team. Serve 13. Four teams serving once per month, e.g. Team 1 on the first week, Team 2 on the second week, etc. On months with five weeks, the extra week will be covered once per year by each team in rotation - i.e. during a year each team will typically serve 13 times. You must have 4 teams to be able to select Serve 13. It's also possible to use Serve 13 with 5 teams, with Team 5 being assigned to all fifth weeks of the year. Scrolling down the Add Rota page you can view the ministry's Members section, listing any teams, members and roles that have been previously added for the ministry. Refer to support article sections below for further information on managing teams, members and roles. 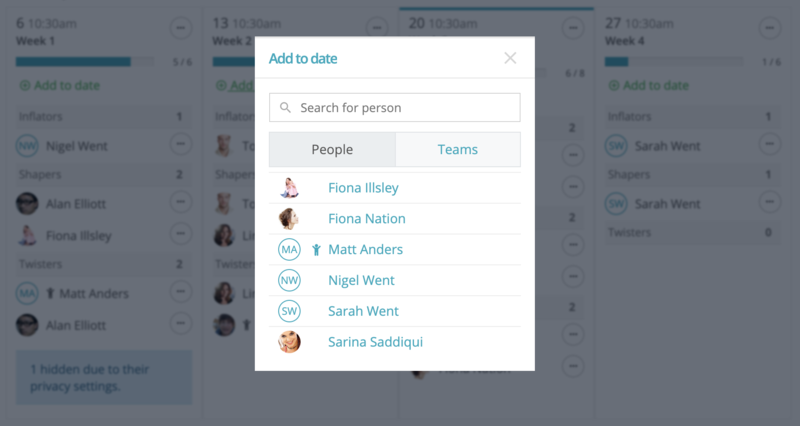 At this stage, prior to saving your new rota, you can make changes to teams, members and roles if you wish. When you have completed making changes, click Save Changes to create the new rota. Once a rota is created, it is not possible to change the rotation; however you can still make ad hoc changes to your rota e.g. adding additional team members, amending roles etc. If you need to change a rota's rotation, delete the old rota and create a new one with the correct rotation. New rotas are created with a Draft status. See later in this article for how to Publish and distribute a rota. Begin by clicking through into a rota from the Rotas list in My Rotas. Rotas that you oversee are distinguished in the list with a Pencil icon in front of the rota's name. Active rotas are distinguished with a Green dot on the right-hand side of the list. Draft rotas have a Red dot. Within the rota, scroll down the page a click on the Members tab. Here you can view and manage existing teams, members and roles for the ministry. For a new ministry it may be that no teams have been added yet. You can do that now. To add a new team, select + Team at the top of the Members tab. Enter a Team Name e.g. Week 1, Week 2, Team A, Team B, Reserves, John's Team. You can also add team members here, if you wish, using the Add team member option. Only people whose privacy options have Name is visible can be searched. The search results list will auto-suggest as you type. Select a person from the list to add as a member. Depending on the roles that have been defined for the ministry, you can also assign a role to the new team member. Continue adding further team members if you wish. When you are finished, click Save Changes. The newly created team is added to the end of the list of teams on the Members tab. You can also add members to a team by clicking + Member. As before, use Add team member to search for a person to add to a team, assigning roles as appropriate (if roles have already been set up for the ministry). Note also the option to Update rota, which will update the selected existing rotas by adding the new team member to rota dates where that team is serving. As well as adding teams, team members and roles, you can also change the Order of teams, which will affect the order of new rotas added in the future - changing the team order will not change the order of team rotation for existing rotas. Use the Up and Down arrow controls to set the ministry's team order as desired. The team Order is used when adding a new rota with Simple Rotation or Serve 13. Click Save Changes when finished. ...Remember to click Save Changes afterwards. 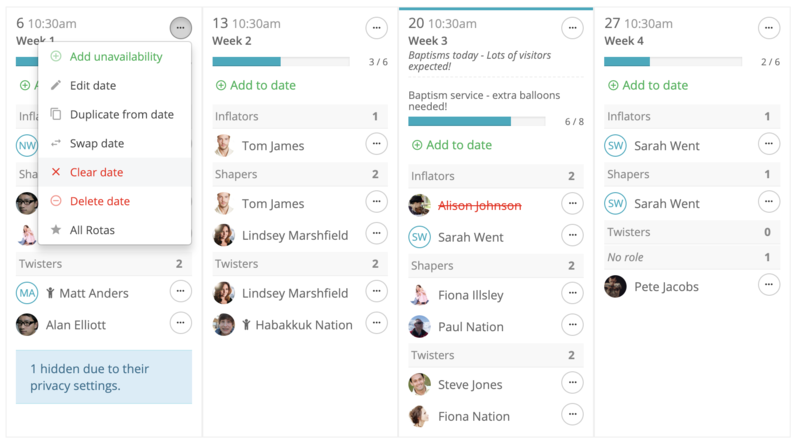 A great feature of ChurchSuite's rota functionality is the ability to create rotas that people can sign up to based on their availability. Rota sign-up is ideal for growing ministry team numbers, or for publishing an empty or partially-completed rota to invite ministry members to sign-up to. 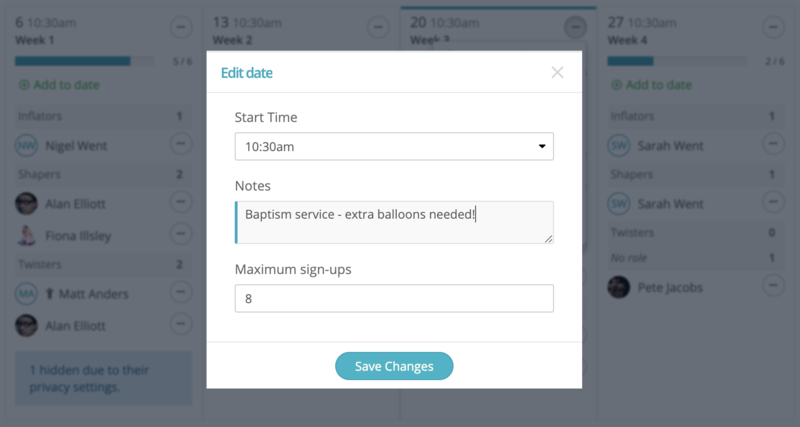 It's possible to set a sign-up capacity for all future dates on a rota, or just for certain dates - perhaps where you know you'll need extra people serving. Once the sign-up capacity for a rota date has been reached, no further sign-up to that date is possible. 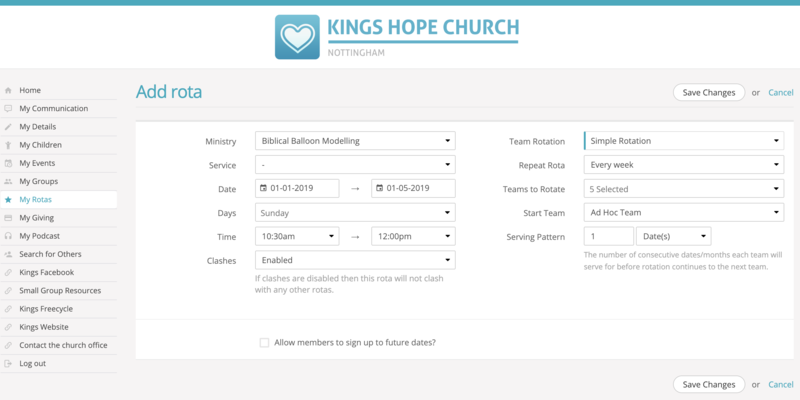 Sign-up can be enabled on a rota-by-rota basis, giving overseers flexibility to choose the rota-recruitment method that works best for their ministry. Rota sign-up can also be disabled at any time. Rotas with sign-up enabled are distinguished with a tick symbol in front of the rota name in the Rotas list in My Rotas. Ministry members can then click + Sign Up for any rota dates they are not already serving where there is available capacity. Signing up displays a confirmation to the ministry member. Overseers do not receive sign-up notifications, but they can view the state of a rota in My Rotas at any time. Once signed up, a rota member cannot cancel a sign-up, but they can organise swaps in the normal way. Having created a rota, enable sign-up by clicking Edit to edit the rota's settings. On the Edit rota pop-up, tick to Allow members to sign up to future dates and specify the Maximum sign-ups per date quantity. For example, if you already have 2 members on a typical rota date and want to increase that to 6, set the sign-up capacity to 6, not 4. Note that this 'maximum' is a rota-wide quantity that is applied to future all dates on the rota. ...and set the revised Maximum sign-ups for that date. Click Save Changes to apply to change. A sign-up progress indicator on each rota date shows the current sign-up progress. Whenever you're working with a Draft rota, an information message is displayed at the top of the rota page. Click Publish rota to change the rota's status to Published. Publishing a draft rota gives you the option to send the rota to the rota's members, perhaps to let them know there's a new rota, or to let them know that significant changes have been made to an existing rota. Optionally change the default email Subject and Body content, perhaps adding an introductory message - the full rota and rota member list is appended to the email automatically - click Preview to see what that will look like. Note that only those contact details of rota members whose privacy settings permit are included - if any team member has chosen not to make their contact details visible, they won't show in the rota email. Click Publish Rota to send your rota and set the status Published. When viewing Dates on a rota, you can switch between Name view (rota member last name alphabetical order) and Role view. 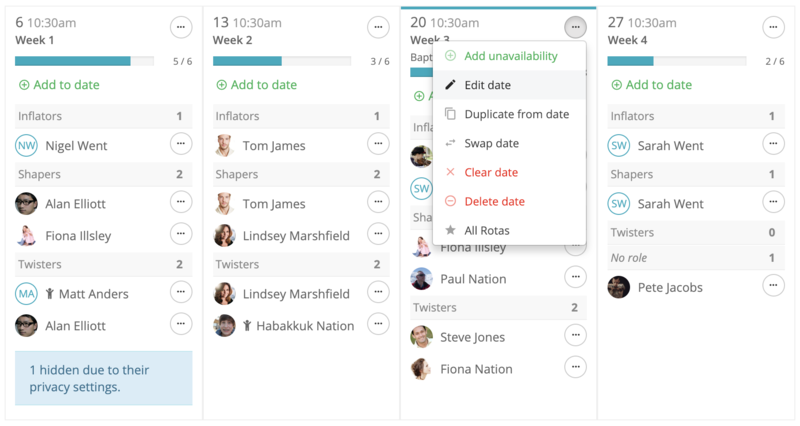 Using Role view can be helpful for quickly identifying empty roles, whether you have sufficient rota members covering each of the roles on a given rota date and whether you have rota members with no role. 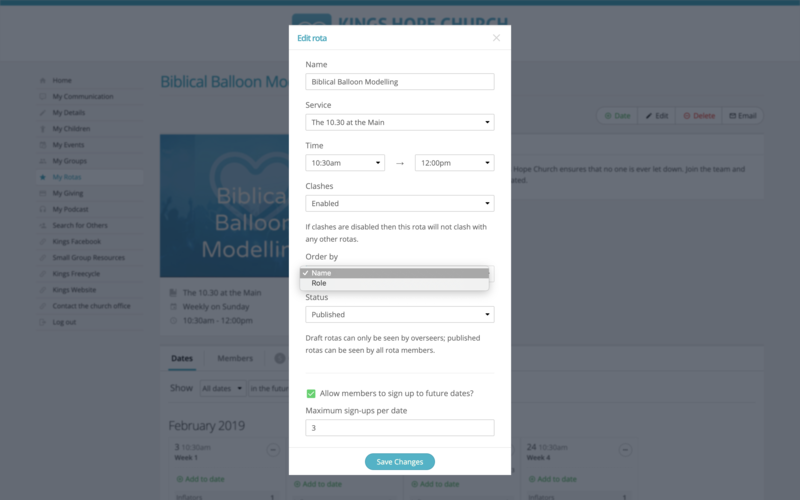 It is not possible to change the order that roles are displayed in within My ChurchSuite - the role order is determined by order set in your church's ChurchSuite Rotas module. To change the rota View, click the Edit [rota] button in the top-right corner of the rota page. There, select the desired view from the Order by drop-down menu. Click Save Changes to apply to change. Once a rota is created, it's often necessary to make changes. 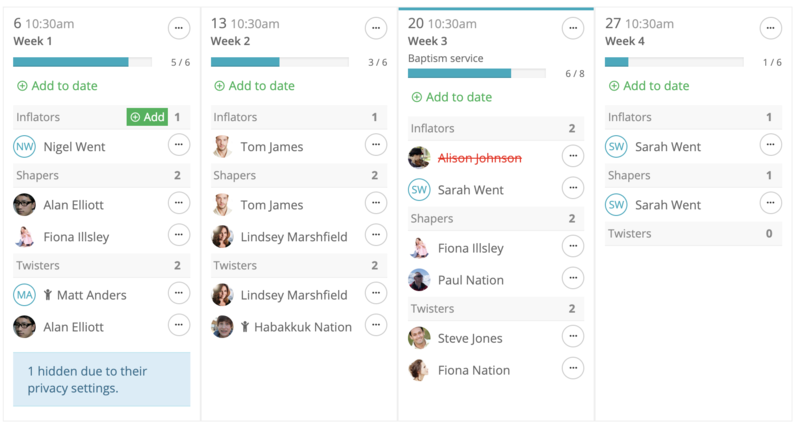 You can add people directly to a rota quickly and easily, without necessarily adding them to the underlying ministry member list. Begin by clicking + Add to date. The Add to date pop-up window opens. Either, select from the list of People or Teams, derived from the ministry's Members list. Ministry members are added to the rota date with the role(s) assigned in the ministry's Members list - these can be changed. Children in the list are distinguished by a 'child' avatar next to their name. Only available ministry members not already on the rota date are listed. Names shown in red indicate that the person is already serving on another rota at thew same date/time, which will give rise to a clash. 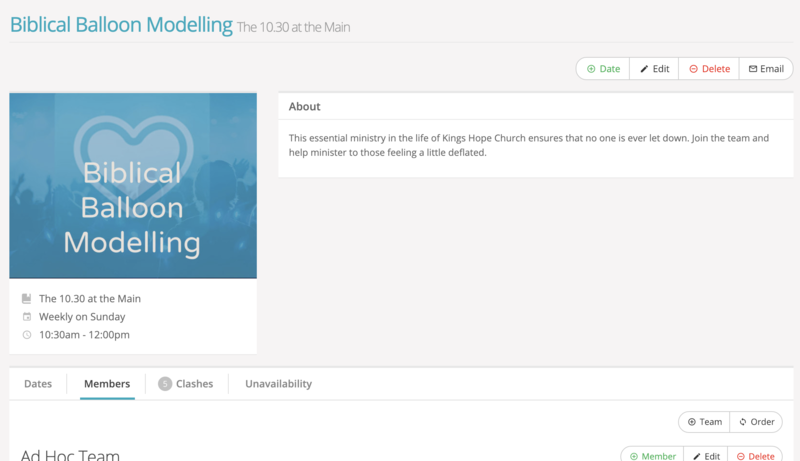 Or, use Search for person to add an ad hoc person who is not a ministry member. Adding ad hoc people to dates on a rota does not add them to the underlying ministry Members list, just to that rota date. The search results list auto-suggests as you type. 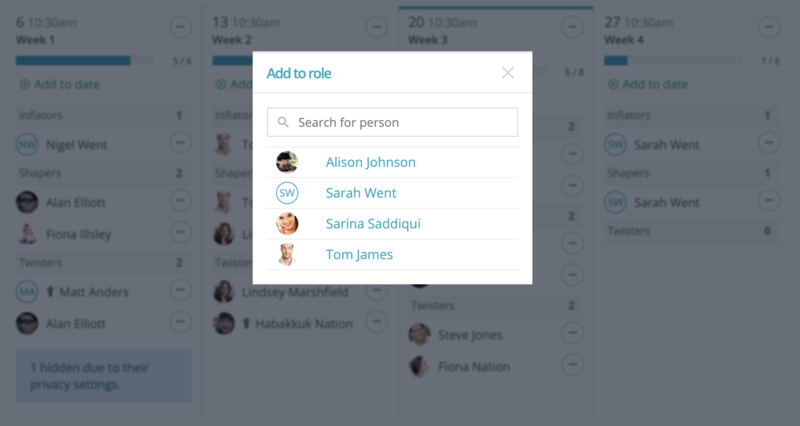 It's also possible to add people direct to a role on a rota date. Hover your cursor over a role and click the Add [to role] button that is revealed. As with adding people to a rota date, select a ministry member from the list to add to that role, or use the Search option to add an ad hoc non-ministry member to the role. Again, only available people not already serving on that rota date can be added to a role. To add someone already serving on the rota date to an additional role on the same date, use the Edit role option - see later. When you add ministry members to a rota, they're assigned any role(s) specified in the ministry Members list. Roles can be added, removed or changed within a rota without affecting the roles assigned in the ministry's underlying Members list, enabling you to make ad hoc rota changes on any given rota data. 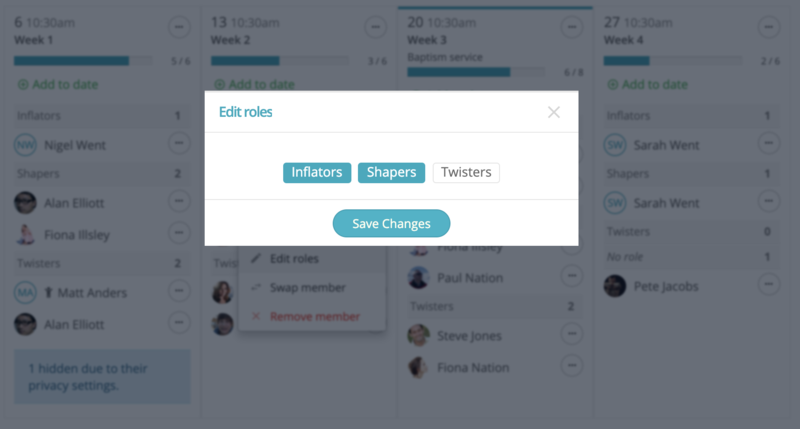 Importantly, rota members can be assigned multiple roles - in Role view this means a rota member will be shown on a rota date more than once - their name will be listed under each role that they are assigned to. To add or edit rota member's role, click the Edit role menu option next to the rota member's name. For rota members without a role, you'll select Add role. In the Add role or Edit roles pop-up window that opens you can now select roles (or deselect roles) from the list of roles available to the ministry. Click Save Changes once you've made your role selection. 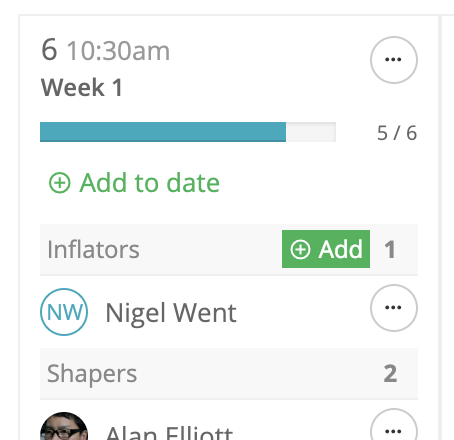 In Role view, you get a visual numeric indicator or the number of rota members in a role. If you hover the cursor over a role, the + Add [to role] button appears. Any rota members added using the + Add button will be assigned with that role automatically. 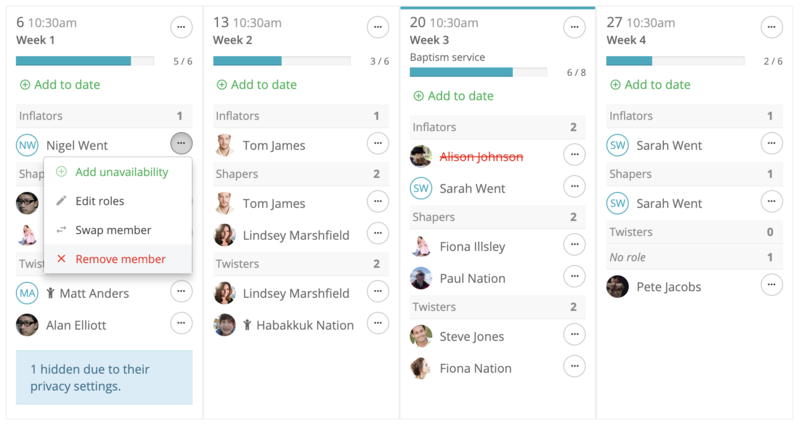 This is therefore a much quicker method of adding people directly into roles on your rota, compared to the + Add to date followed by Add role methods explained above. In addition to adding people to a rota date individually, you can also duplicate all the rota members from another rota date - ideal for quickly populating dates on an Ad Hoc rota that have the same people serving several dates. Within the rota date you're wanting to add people to, select Duplicate from date from the Date's actions menu. On the Duplicate from date pop-up window, select the Duplicate from date from the drop-down menu and optionally choose whether to also overwrite and Include team name and Include date notes on your target date. You can also select to Remove existing members from the target date, creating an exact duplicate of the date you are duplicating from. Click Duplicate From Date to confirm your selection. Like duplicating from a date you can also swap an entire list of rota members (including their assigned roles) between two dates on the same rota. Working with either the source date or the target date, select Swap date from the Date's actions menu. On the Swap date pop-up window, select the Swap with date from the drop-down menu. The people from that source date are listed (with their roles). Confirm the swap by clicking Swap Date. To remove a person from a rota date, select Remove member from the action menu option next to a contact's name - hover your cursor over their name to reveal the menu. The Remove member pop-up window opens. 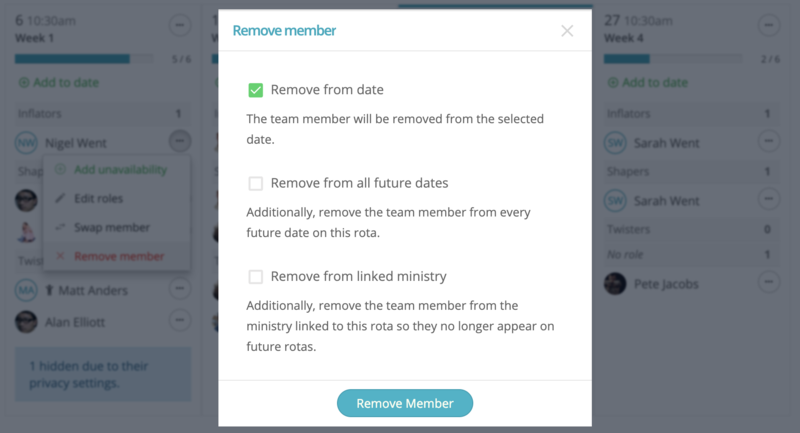 In addition to Removing from [the selected] date, you can optionally remove the rota member from All future dates on the same rota, and to additionally Remove from linked ministry entirely (which will remove them from all teams). Special occasions, like Baptism services, can often catch us out on rotas - extra visitors may mean additional serving team members are needed. Rota notes are rota-specific and allow you to add custom messages to any date on a rota as a reminder to both rota members and overseers. Rota notes are also shown on rota reminder emails (if added before the reminder is sent!). To add a rota note, select Edit date from the Date's actions menu. On the Edit note pop-up window that opens, type your note in the Notes field. You can add multi-line notes and even include short URL links if you wish. Click Save Changes when finished. The note is added to that rota date. If the rota is linked to a service and a leader has added a service note, those service notes will be displayed on all rotas for that date and service - service notes are shown in italic font before rota notes. You can easily add additional dates to a rota. Dates can only be added individually. It's intended that new rotas are created for the next season, rather than endlessly extending existing rotas. To add a date to a rota click the + Date button at the top of the rota page. On the Add date pop-up window that opens, enter the Date to add and Start Time and any optional rota Notes. If rota sign-up is enabled for the rota, set the Maximum sign-ups for the date being added. Click Add Date to save the changes. The new, empty date is added to the rota ready for you to add people to - perhaps by duplicating from an existing date (see earlier support article section). You can either clear down the rota date, which will remove all team members and leave the date in place on the rota with empty roles (perhaps to be added to another time); or you can remove the date entirely. Neither of these changes make any changes to your underlying ministry Members list. Before deleting a date it may be helpful to consider what your rota members expect to see when viewing their rota. A deleted (missing) date may be confusing to them, but an empty date with a suitable rota Note of explanation will be much clearer. To clear down the team members for a given date, select Clear date from the Date's actions menu. You'll be asked to confirm. To delete the date entirely from the rota, including all rota members and roles on that date, select Delete date from the Date's actions menu. You'll be asked to confirm. Each rota has its own unique Rota email address. Rota group emails are "closed group" emails. Only rota members will be able to send and receive emails. 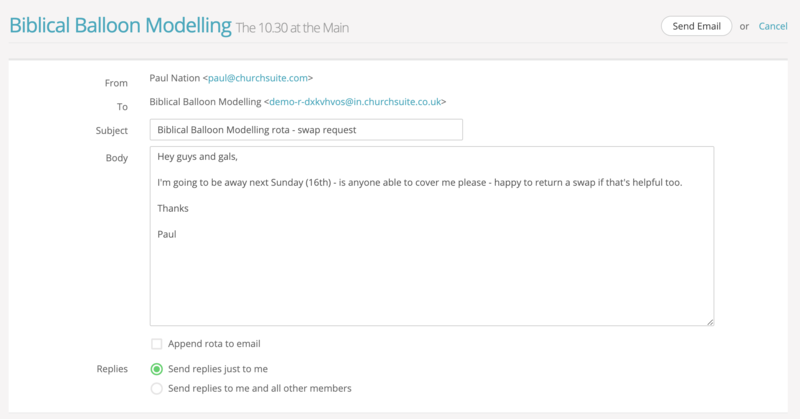 Group emails sent from within My ChurchSuite are delivered to the rota member's regular email application and can be viewed in the My Communication section within My ChurchSuite. Rota group email is ideal for circulating prayer requests, important rota notices and organising rota swaps between members of the rota. New group emails are sent to all rota members - it's not currently possible to further filter by date, team or role (feature coming soon!). When sending a group email, the author can specify whether to Send replies to just me (the author) or Send replies to me and all other [rota] members. Rota overseers have a further option to Append rota to email - ideal if you wish to circulate a significantly updated rota or if some rota members don't yet have access to My Rotas. 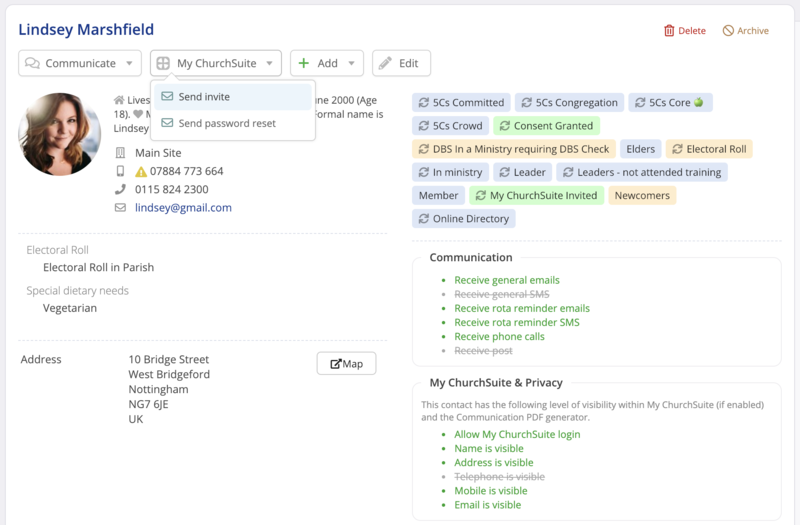 Group emails are private and are not logged in ChurchSuite's Rotas module, but they are logged in the My Communication section of all recipients and the author. In most cases your rota will have the name, serving times and service assigned when it was first created. To change these, Edit [rota] at the top of the rota page. From the Edit rota pop-up window that opens, you can now can edit the rota's Name, Service and/or Time. When changing a rota's serving times, be careful not to contradict the service the rota may be assigned to - for example it would be confusing to rota members to receive a rota reminder email asking them to serve on the Refreshments rota between 6pm and 7.30pm at the 10.30am Service! Remember to click Save Changes to apply the changes. Q. Can I create a new Ministry in My Rotas? A. No. Creating a new Ministry and assigning overseers remains an admin function that needs to be done in ChurchSuite by a User with 'Manage' or 'Administrator' permission for the Rotas module. Overseers do not have the ability to do this within My Rotas. Q. Can I change the rota rotation once a rota is published? A. Whilst you can make lots of changes to rotas once they're published, it is not possible to change the rotation - a rota inherits its rotation at the point it is first created. Therefore, to create a rota with a different rotation add a new rota with the new rotation. You can then remove the old rota. Q. What's to stop anyone from signing up to be the preacher or a leader!? A. Only members of the underlying Ministry can sign-up to rota dates in My Rotas. Additionally, 'sign-ups' can only choose from those roles already assigned to them in the underlying Ministry. This can be helpful for your worship team for example - you could use Roles in the Ministry to reflect all the instruments that people can play, and then, at the point of signing up, a multi-skilled musician can select which role(s) they are signing up for. Churches may, however, prefer to only designate very specific roles to team members based on their training or skills - only those designated roles would be displayed to the member at the point of signing up to a rota date. Q. Do overseers receive a notification of rota sign-up? A. No. 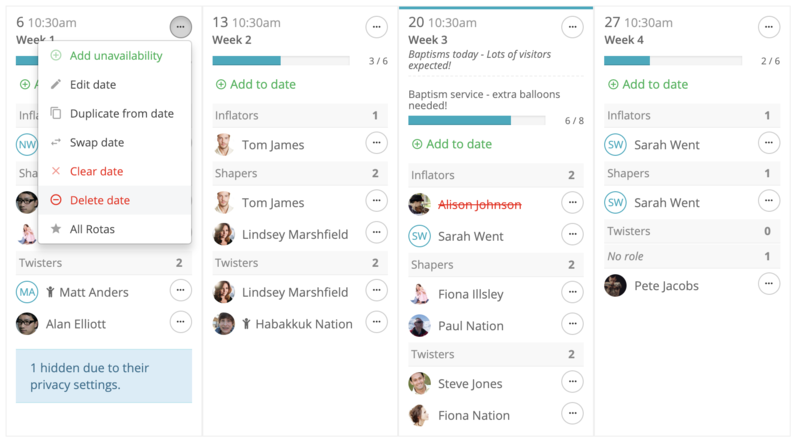 Imagine a large church publishing an empty weekly rota with a sign-up capacity of 10 people for a 6-month rota - the overseer would receive 520 sign-up notifications! We don't think this is helpful to the overseer. Instead, overseers can view their status of their rota at any time in My Rotas. A visual sign-up indicator bar shows sign-up progress on a date-by-date basis. Q. What clash notifications are provided? A. When overseers add people to a rota date and they're already serving on another rota on the same date and time, a clash notification is displayed for the overseer - the overseer can then choose to proceed and accept the clash, or cancel. Similarly, if a ministry member attempts to sign-up on a date/time when they are already serving on another rota, a clash notification is displayed and the sign-up is not permitted. Q. Can I set up or modify rota reminders in My Rotas? A. No, this is not currently possible. 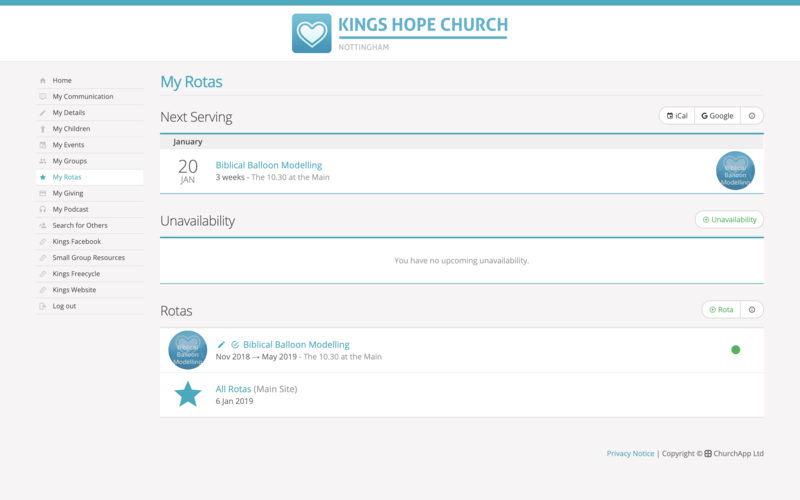 Rota reminders are part of the underlying ministry of rotas and these can only be set up or modified by a Rotas module user in ChurchSuite. Q. Can I bulk add multiple dates to an existing rota? A. No, it's intended that new rotas are created for each new rota period, rather than endlessly extending existing rotas. Ad hoc dates can only be added to a rota one date at a time.